It is William Shakespeare’s birthday! I have been celebrating by sneaking Shakespeare quotes into my conversations and emails (no one noticed, but it made me excessively happy nonetheless). I will also be paying double homage this evening, celebrating both my love of the Bard and my love of Tom Hiddleston by watching Henry V (the BBC’s Hollow Crown series, which is beyond amazing). It is World Book Night (WBN)! An opportunity for bibliophiles everywhere to share their love of reading. WBN is a fantastic event, created with the recognition that not everyone is fortunate enough to have the access to literature that so many of us enjoy. This has recently become an even more acute issue in the UK, with the current government instituting serious funding cuts to our libraries. It is my view that the situation is a truly dire one, with one-third of households in the UK lacking a single book. Such statistics are beyond tragic. WBN works to combat this trend by encouraging those with a passion for reading to spread the joy – through donating books as ‘givers’, attending local events, or simply telling others what reading means to them. I assume that those reading this blog share a respect for the power of literature, both in terms of enriching and educating. And I believe that we have a responsibility to share this respect. The beauty of the internet (even if, as with myself, you spend most of your time engaged in a technological battle) is that our communities have gone global. In fact, part of my reasoning in starting this blog (yes, it truly is about more than the Colin Firth references) was to join the worldwide reading community. And, whether or not you are able to physically attend a WBN event, there are still many ways of celebrating, for which the internet serves as a fabulous forum. One suggestion made by WBN is that the readers out there simply share the reasons behind their love of reading. Now, I completely understand the difficulty here. Expressing why you love reading is, I think, similar to being asked why you love your bed or (even more troubling) why you love a nice cup of tea. But in the cause of unity amongst readers and a profound respect for the principles behind WBN, I will do my best to summarise my own thoughts. I love reading because … it lets us experience something so profoundly human. It connects us to our shared past and present, and it lets imagine innumerable futures. When I read, I am living another life and being privileged with a window into experiences so completely different from my own. Books have the power to take you anywhere, demonstrating that there truly are no limits to the human imagination. My love of reading is absolutely the thing for which I am most grateful. Without it I would be lost. Because each book I read works a change, however minute, in the way that I see the world. Because, in the words of fountain of wisdom C. S. Lewis, we read to know we are not alone. So (although there is no way for me to say this without sounding like a teacher), I would encourage you all to take a minute to think about what reading means to you. It is so easy an ability to take for granted. But when I see library doors closing and learn that 1 in 3 households does not possess a single book, I know that it is not something about which we can afford to become conceited. I hope you will all take an opportunity to share your thoughts, either by commenting on this post or simply by telling someone you know about WBN and the work that it does. And, with that, my stream of consciousness comes to an end. Here’s wishing you all a very literary evening! I’m off to do a bit of reading before my Shakespeare (*cough* Tom Hiddleston) appreciation extravaganza. See you all tomorrow for a very exciting What I’m Reading Wednesday guest post, and stay tuned this week for some more reviews and an epic Harry Potter-related Giveaway! I am also a book addict. 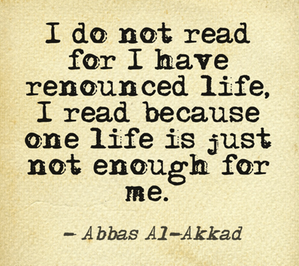 I cannot imagine my life without books. I think myself so lucky that in Aberystwyth, the town near where I live, we have a new library which opened last year. I have the added benefit of a mobile library that visits me every month. It is a wonderful service and I hope that with so many cuts in public services, the library doesn't have to close.